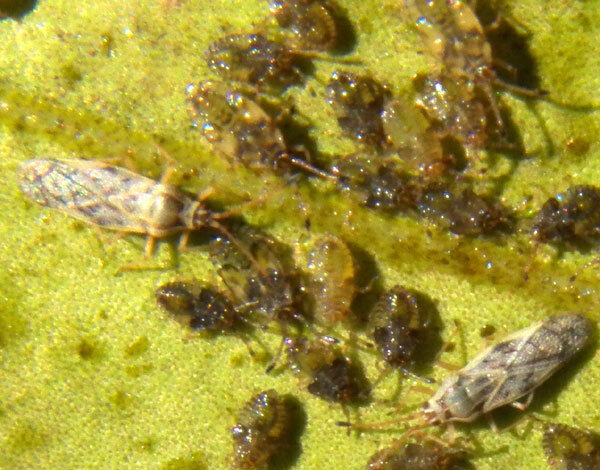 This group of lacebugs includes many nymphs and two adults. Observed on olive, Olea europaea africana, near Eldoret, Kenya. January 2012. As with most lace bug species they are quite small with adults less than 3 mm. Lace bugs often occur in family groups on the undersides of their host plant leaves. They do not move far and as they remain feeding on the leaf through piercing-sucking mouthparts, the leaf becomes visibly damaged and coated with the bugs' excrement and cast exoskeletons. From the top side of the leaf their feeding is evidenced by pale, necrotic spots. Many lacebugs have intricate borders of lacey chitin, but this species does not. There are many kinds of lace bugs and most are rather specific regarding the species of plants upon which they feed.